Children held overnight in police custody from Scotland on Sunday – A Freedom of Information investigation into the hundreds of children detained overnight in police custody across Scotland. Some of the children held were as young as 12, while teenagers were detained for as long as 88 hours. CHILDREN as young as 12 are among hundreds who have been held overnight in police cells in Scotland over the past two years. Some youngsters have been kept in custody for several days, with one 15-year-old boy being detained for more than 88 hours. The practice, which goes against a United Nations treaty protecting children’s human rights, has been described as “disturbing”, while Scotland’s Commissioner for Children and Young People warned police were in breach of the law. The data, released under Freedom of Information legislation, also flags up significant disparities across the country. Whereas officers in some areas, such as Grampian, say they did not detain a single child overnight during the period, the practice was routine elsewhere, despite a series of recommendations to overhaul and streamline the system outlined in an HM Inspectorate of Constabulary for Scotland inspection five years ago. No reasons were given as to why the detentions had taken place. In the former Lothian and Borders force area, 187 children aged 15 or under were held in custody overnight, defined as a period which started before and ended after midnight. They included two 11-year-olds, ten 12-year-olds, and 21 13-year-olds. Although most children spent only a few hours in custody, the records include a 14-year-old boy arrested and held for more than 36 hours, and another 14-year-old boy held for more than 26 hours. One 15-year-old boy arrested in 2011 was held for more than 88 hours. The same year, two 15-year-old boys were arrested and held for more than 37 and 34 hours respectively. In 2012, meanwhile, one 15-year-old boy was held for more than 59 hours after being arrested, while a 14-year-old boy was arrested and held for more than 21 hours. In Tayside, the force detained 124 children aged 15 or under overnight during 2011 and 2012. They included eight 12-year-olds, six of whom were held for up to eight hours, and three 13-year-olds detained for up to 24 hours. The former Northern Constabulary said it was not able to disclose the hours, but a nine-year-old, a ten-year-old, nine 11-year-olds, 37 12-year-olds, and 67 13-year-olds were among 664 detained children. Not every force disclosed information. The former Fife, Dumfries & Galloway, and Central Scotland regions cited excessive costs, while the former Strathclyde Police said the information requested was not obtainable. This suggests the number of child detainees held in breach of the law may be significantly higher. The length of time spent in custody by some of the children goes against Article 37 of the UN Convention on the Rights of the Child. It states that the arrest or detention of a child “shall be used only as a measure of last resort and for the shortest appropriate period of time”. The Criminal Procedure (Scotland) Act 1995 says a child should not be kept in custody other than in exceptional circumstances, such as where they face a charge of homicide. Even then, they should be in a place of safety other than a police station. 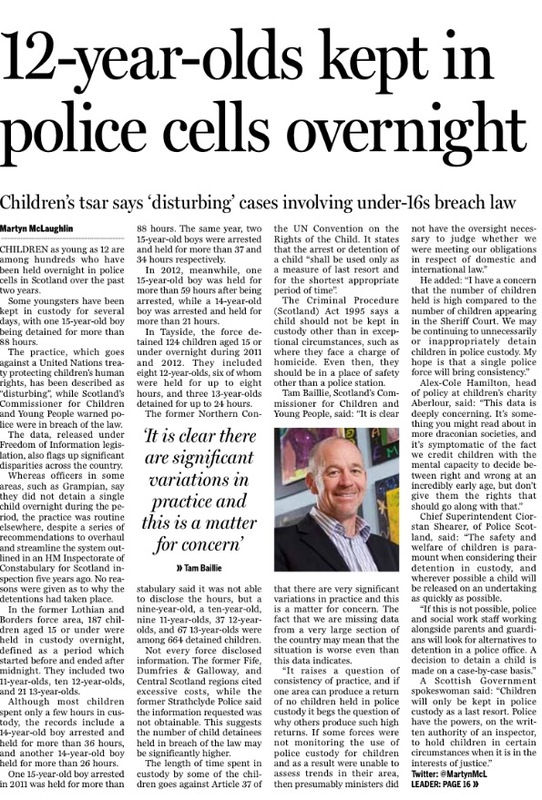 Tam Baillie, Scotland’s Commissioner for Children and Young People, said: “It is clear that there are very significant variations in practice and this is a matter for concern. The fact that we are missing data from a very large section of the country may mean that the situation is worse even than this data indicates.